When ordering this item as a gift that you want sent directly to the recipient, you can let me know what to write on the postcard that comes with it. "YEAH, HIJ IS HIER, ZEG HET VOORT. DE VERLOSSER, JE GEBEDEN ZIJN GEHOORD"
Celebrating the 15th anniversary of Rotterdam's most energetic cultural export and everyone's favorite calorie bomb, the Kapsalon. Finally available as an enamel pin! The dish is a beautiful representation of the cultural diversity of the city, as it was invented by a Cape Verdian hairdresser (kapsalon is Dutch for barbershop), first made by a Turkish kebab shop. Combining French fries, shawarma meat, Dutch cheese, salad, garlic sauce and Indonesian sambal sauce. 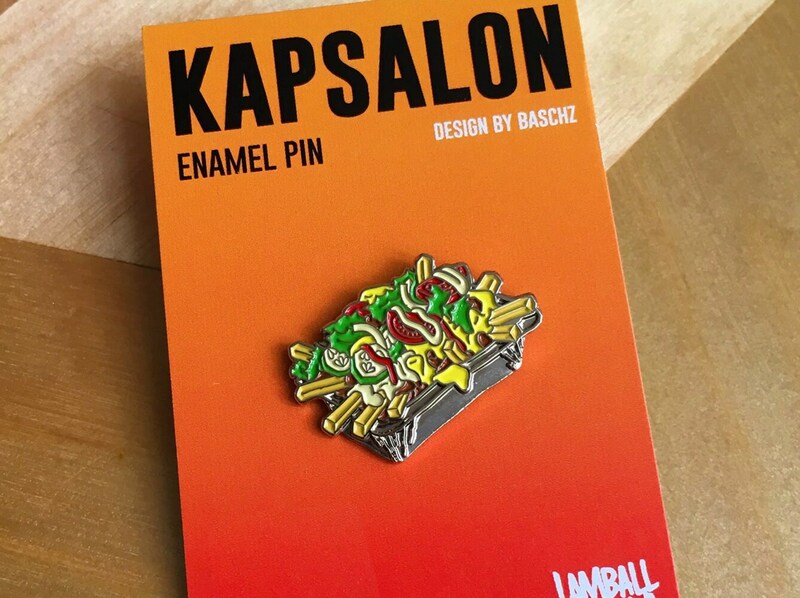 This soft enamel pin is approximately 3 x 2 cm, nickel plated, with a round steel clutch (see pictures) and comes on a double-sided backing card which tells the story of the Kapsalon on the back. It makes a great gift to snack and fast food lovers as well as a perfect Rotterdam souvenir. Eventhough the dish has already way outgrown its birth city, as it has been spotted on menus as far as Kathmandu and New York. Pins will be packed with care and sent as soon as possible in a bubble wrap envelope so they won't damage. If you have any questions, like adding a gift note, just let me know. Thanks for stopping by! Beste pin OOIT. Iedereen jaloers. Snelle verzending ook met zesduizend stickers erbij. Snel verzonden. Ziet er goed uit! Product was binnen 2 dagen geleverd. Product was delivered within 2 days. Why don’t I get iDeal as a payment option?